Manufacturing and Trading of a wide range of Clutches and Brakes. 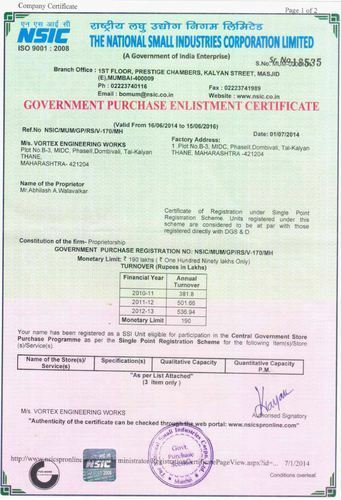 "Vortex Engineering Works", an ISO 9001:2008 Certified Company established in the year 1983, is engaged in the manufacturing and supplying Industrial Clutches and Brakes. We also produce Industrial Brakes, Industrial Clutches and Industrial Gearboxes according to customers drawings and specifications. The offered products are well-liked by the clients for their durability, reliability, corrosion resistant nature and various others. Our range of products is known for its efficiency and high performance. The reason for our success lies in the hard work and dedication of our team who work flawlessly to bring out the best products that caters to the needs of our clients. With over three decades of experience in the industry, we ensure that our products are made with quality materials and engineered to be dependable and of a superior quality. The whole ambit of products is checked on quality parameters to ensure the compatibility with other industry standards. Our products have got acceptance throughout the country. The quality has been helping us to be on the top in the industry. Further, we work on the demands of the market to attain maximum client satisfaction. It is owing to the industrious efforts of our team that we are able to supply the products within the committed time. With the broad perspective and visionary approach of "Mr. Ashok Bhat", the company has persistently touched new dimensions. His fair business tactics and sharp business acumen have enabled us to reach the apex of success. It is owing to their experience and knowledge that our team is able to function in an able manner. 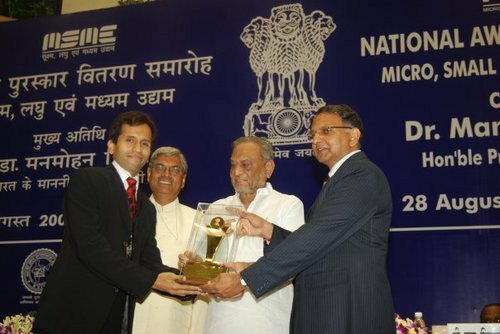 Mr. Abhilash Walavalkar receiving the NATIONAL AWARD FOR IMPORT SUBSTITUTION. We have also established our sister concern partner Core Drivelines (India) Pvt. Ltd. on 31st March 2003. The main reason behind the setting up of the firm was to cater high performance product lines at the stiff global prices. The firm is 100% Export-Oriented-Unit (EOU) engaged in outsourcing the part of production of our Italian partners and customers. The organization was established for offering our Italian partners with the extremely high-quality products at the low cost. The firm offers the cost-effective range of FR series brakes and Spring applied electromagnetic release holding motor brakes. The simple in construction brakes are efficient in holding load. They are basically D.C. Voltage powered with a single friction surface & an integrated fan. The fan is useful for the cooling of the brake motor on which it is mounted. In case of power failure to hold the load, the combines braking package is suitable for many of the standard brake motors. The FR series have several features of brake which includes a F-class epoxy potted resin encapsulation an H-class enameled copper wire and a robust friction lining coupled with an equally efficient grey cast-iron brake motor fan. We are backed with the team of diligent and experienced professionals. The organization has selected the professionals only after only after making rigorous assessment of their experience and skills. Our team is a group of professionals catering same area of specialization. The team of appointed quality controllers keep their eye on the products and only quality-approved products are supplied to the customer's. Similarly, we have team of engineers in manufacturing unit, who are engaged in producing the efficient products. In the same way we have team of other professionals which work in proper sync and coordination in order to offer our clients the most suitable product. Over the years, we have attained a remarkable position in the industry. We are offering our clients quality-approved products on the stipulated time-frame. Also, we are most preferred in the market for our ethical business policies and transparent deals.